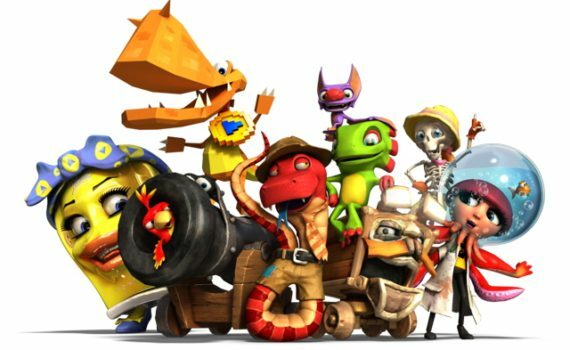 When Playtonic first announced the game on Kickstarter back in 2015, it took less than an hour to reach its initial funding goal of £175,000, and less than a day to hit £1m. Yooka-Laylee ended up raising over £2m. There’s clearly an appetite for titles harking back to the N64’s heyday, then, but for Playtonic’s managing director and creative lead Gavin Price (pictured below), Yooka-Laylee isn’t just about bringing back the 3D platformer days of yore. “I think first of all we’ve tried to capture the core audience, the people who backed us and the people who fit the profile of what our backers are,” Price tells MCV. In addition to its digital release on PS4, Xbox One and PC on April 11th, Playtonic and publisher Team17 are also partnering with Sold Out to bring Yooka-Laylee to retail – a move Price says is the perfect fit for its family-friendly gameplay. Price is also hoping Yooka-Laylee will catch the eye of more traditional gamers who perhaps don’t have 50-odd hours to spend playing single player games anymore. “Even though we’ve inadvertently made a much bigger game than we realised when we actually started sitting down and playing through it, we’ve always built the game from the ground up with content that can be accessible to someone who isn’t time-rich and who doesn’t have a lot time to spend [playing games],” says Price. “Features such as the co-op and couch multiplayer [are also aimed at] family gamers who are looking for that game where parents can perhaps play it when they’re just around [by themselves] to when the family is all there and everyone can pick up a pad and everyone can play as something to do. Of course, after the backlash over the price of Hello Games’ No Man’s Sky, deciding how much Yooka-Laylee should cost at retail inevitably became a bit of a minefield. “The word ‘indie’ is a label now that means one thing and yet price-wise, I don’t think that a game that’s independently developed means it has to fall into a certain price bracket,” says Price. “It should all be judged based on the game quality and length itself. I can certainly see why there’s value for games at a variety of different prices and it would be great to see more indie content have physical releases and it be a viable business for them, and the price structures at physical retail be flexible enough to allow that. I’d certainly buy it myself,” he enthuses.